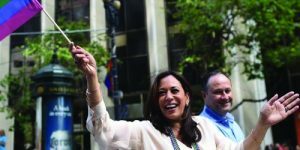 That Democratic California Sen. Kamala Harris announced her candidacy for president on Dr. Martin Luther King Jr. Day is no coincidence. “Justice. Decency. Equality. Freedom. Democracy. These aren’t just words. They’re the values we as Americans cherish. And they’re all on the line now,” Harris said in the video, teasing her official kickoff in her birthplace of Oakland Sunday Feb. 27.